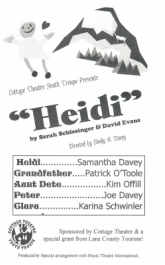 Heidi is presented through special arrangement with Music Theatre International. Recently orphaned and turned over to her ill-tempered grandfather, the young Heidi feels out of place, but finds a fast friend in goatherd Peter. With his help, she finds ways to get past her grandfather's callused exterior. Just when a bond is forming, however, Heidi is whisked away by her aunt to Frankfurt. Coupled with her sharp wit and strength, she becomes determined to find a way back to her grandfather's arms.